The importer Vom Boden, meaning “from the soil” in German, works with growers who are dedicated to showcasing and preserving the uniqueness of their vineyard sites. Every bottle in the Vom Boden portfolio is a testament to the individuality and authenticity to be found in the many overlooked, twisting curves of the Mosel and beyond. 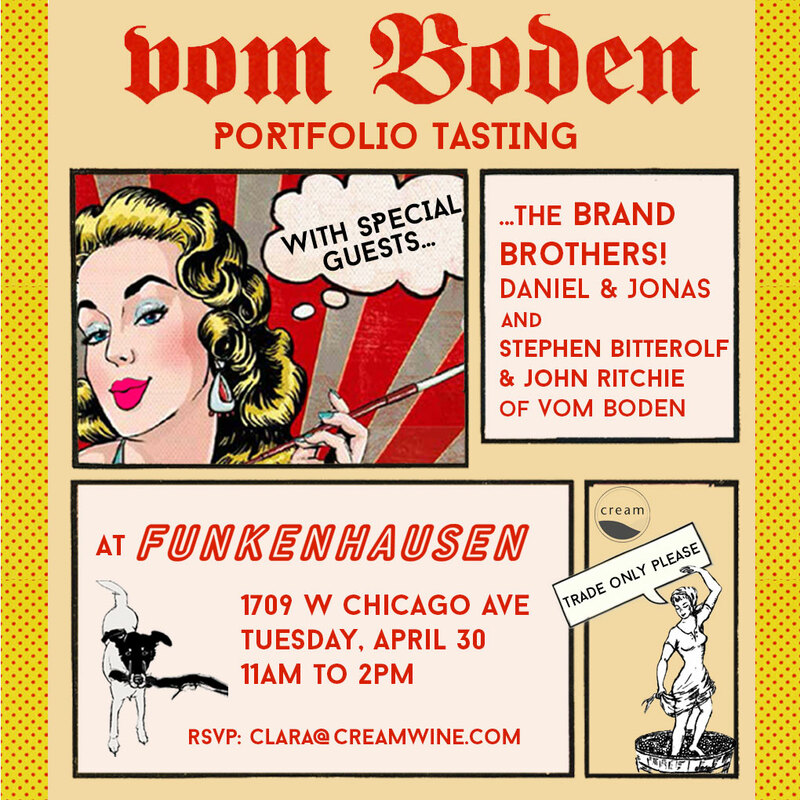 Join Cream & Vom Boden at Funkenhausen for a portfolio tasting with some German food to match. Wines presented from very special guests, the Brand Brothers! Stephen Bitterolf founded Vom Boden after nearly a decade in the wine industry. He was the Wine Director at Crush Wine & Spirits in New York City where he helped build one of the nation’s largest fine wine programs with a special focus on Austria, Germany, Burgundy, Champagne, Piedmont and Northern Rhône. He is joined by National Sales Director, and Vom Boden’s first hire, John Ritchie. The brothers Brand, Daniel and Jonas, have quickly brought attention to the far northern Pfalz, this cool-climate, limestone-rich, yet otherwise overlooked region. The young brothers took over the family estate in 2011 and are part of a group in the Pfalz, Rheinhessen and Franken turning away from conventional farming and the sins of the 1960s and 70s. 2017 vintage is Brand’s first certified organic vintage, though they have been farming organically for years. The farming is also biodynamic, and everything is manually harvested.